Space is a cruel place. It's cold, it's airless, it's riddled with deadly radiation, and – most cruelly of all – it's just so darned big. NASA's Apollo missions aside, this is why almost all space exploration is done by robots, who are stronger, more resilient, and easier to maintain than humans. So we're not about to stop exploring space using robots any time soon. Instead, though, we're going to wear them – with some claiming that incredible advances in wearable technology could help spread humanity to the very furthest reaches of the galaxy. But it's going to take a lot more than a souped-up smartwatch. Today the most famous space robot is Curiosity. The Martian rover has plenty of company on the red planet, most notably Opportunity, while dozens of robotic space probes are buzzing around Jupiter, Saturn and the dwarf planet Ceres. Here on Earth we also have exploration robots, including robotic submersibles (even underwater humanoid robots) and maintenance droids in the oceans, with autonomous industrial drones and self-driving cars almost upon us. Such robots are extensions of ourselves, and both wearables and robots are already being trialled on the International Space Station (ISS). French astronaut Thomas Pesquet, currently orbiting Earth on the ISS, is wearing BodyCap's Blood Pulse Wave sensor and e-TACT patch, while set to join the ISS crew this year or next is both Astroskin and a robotic cube called Astrobee. Russian cosmonauts on the ISS will get a humanoid robot called FEDOR in 2021. "NASA has a long history of building humanoid platforms, and has Robonaut 2 on the ISS, which is just an upper torso," says Sethu Vijayakumar, Professor of Robotics at University of Edinburgh and Director of the Edinburgh Centre for Robotics, which owns one of NASA's Valkyrie humanoid robots. Although Robonaut 2 comes packed with image recognition systems and sensors galore, its main use is to take care of repetitive tasks to clear astronauts' clogged to-do lists. Robonaut 2, whose development also led to a 'human grasp assist' device called Robo-Glove, could potentially hop outside the ISS to do repairs. Dextre, another 'robotic handyman' on the ISS, has already conducted repairs to the spaceship's batteries, saving the crew from risky spacewalks. Such robots could be used on Mars to assemble a habitat in advance of a manned mission. And it's on missions to Mars and beyond where wearable technology comes in. Robotics on Mars is a different beast to working on the ISS. "Robots on the ISS work in zero gravity, but when you go to Mars they will have to work in varying gravity environments, and will need to have bipedal locomotion, so we need dextrous manipulations, sensing and walking, and that's where we come in," says Vijayakumar, who is working on the ultimate in space wearables: exoskeletons. Exoskeletons are basically wearable robots that make astronauts stronger or more mobile in different environments, but they'll be crucial long before man gets to the surface of Mars. Since micro-gravity makes muscles work less, the crew of the ISS need to work out 2.5 hours per day, six days a week just to keep minimum muscle performance, but they're still weaklings when they descend back to Earth. "Astronauts on the ISS have to strap themselves to a treadmill," says Vijayakumar. "But instead of providing assistance, exoskeletons can act as a resistive device." That will be crucial if astronauts are to arrive at Mars in any fit state, but some serious miniaturisation is needed. "The exercise device on the ISS is 2,000lbs and wouldn't fit in the crew vehicle that would go to Mars, so they will need a new kind of exercise equipment," says Dr. Peter Neuhaus, Senior Research Scientist at Florida's Institute for Human & Machine Cognition (IHMC), which works on technology to extend human capabilities. However, the IHMC is also working on exoskeletons purely for space exploration, developing the X1 Mina with NASA, and more recently Mina V2, which has motors on the ankle, hip and knees. Motors embedded on 'soft' exoskeletons – essentially space suits – would help make up for the differing gravity on Mars, and the fact that space suits are pressurised. "On Mars the gravity is less, so that will help astronauts support their own bodyweight when they try to stand and walk, but they will have spent between six and nine months in micro-gravity getting to Mars, so they might need an exoskeleton for their space suit," says Neuhaus. He explains that the pressurised Apollo space-suits used by NASA on the Moon acted like a spring, making it difficult for the astronauts to bend their legs. Cue motors at all joints to achieve a customised gait. "With reduced gravity we could assist them with different gaits," says Neuhaus." Apollo astronauts used a hopping gait on the Moon's surface, but with exoskeleton devices we could help them to do a more bounding gait, which could help them travel further on the surface." For Vijayakumar it's all about the user interface between man and machine. That means exoskeletons with haptic feedback and 'multi-model sensory information'. "One of our projects is how to provide sensory feedback to amputees who have lost a limb," says Vijayakumar, explaining that his work for NASA is based upon the same technology he's developing for real-time control of exoskeletons for stroke patients, amputees, and for prosthesis. "We have an artificial limb they wear, but they currently don't have ownership of the device because of the lack of feedback." Perhaps the ultimate wearable exoskeleton-like device was shown off recently by South Korean robotics company Hankook Mirae Technology, whose 1.5-ton Method-2is a manned bipedal robot that can travel forwards and backwards, though only on flat ground. As you might expect, this bipedal robot is controlled by someone sitting inside, and apparently 'shakes the ground' when it takes a step, though it reportedly has balance issues. To visualise what engineers will be able to achieve in a decade or so takes some deep thinking. "Future exoskeletons will be much better," says engineer and futurist Dr Ian Pearson, describing a 'Spider-Man' suit a few millimetres thick that uses either electro-active polymers or folded graphene capacitors to create electromagnetic muscles enabling super-human strength. "It wouldn't look like metal armour, more like a wetsuit – and it could be done in 10 years if you had the kind of development budget that a spacesuit normally has," he says. How successful exoskeletons can be in space depends on the gravity of the situation. "Your legs are only of use on Mars and the Moon," says Neuhaus. "They're the only places with gravity, aside from some of the bigger planets, which we're not going to send humans for a very long time." On asteroids, which astronauts will probably have to mine for resources to fuel any long-term space exploration outside the Solar System, gravity is insignificant. 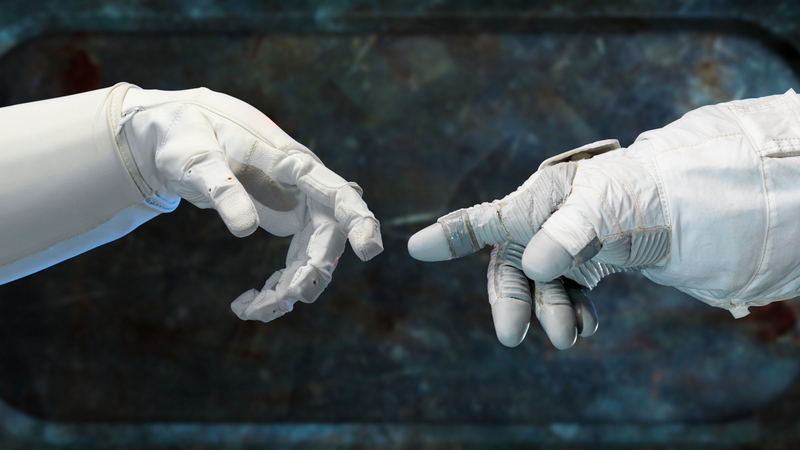 "On an asteroid it would be all about an astronaut's arms," says Neuhaus. "Astronauts would probably be in some kind of floating device around the asteroid, and have use of their arms either directly, or via robotic arms that respond to their motions." That could be done in two ways: the wearable arms could be an exoskeleton; or the user could be an avatar for those arms. Avatars: the ultimate in wearable technology? Ah yes, avatars. "I look at avatars as a sister to robots, but robots powered by human intelligence," says Dr. Harry Floor, CEO at Jupiter 9 Productions and curator of the upcoming ANA Avatar X prize. "The Avatar X prize concept is that we don't just want robots with artificial intelligence, we want to power them using human intelligence so people can teleport themselves anywhere in the world by transferring their consciousness," he said at January's CES 2017. "But it's not like in the movie – you are seeing and hearing through a virtual reality headset, and using haptics gloves you can move, control and touch … there needs to be a marriage between robots and avatars." The German Research Centre for Artificial Intelligence (DFKI) has successfully operated its robot AILA in Germany using its upper-body exoskeleton CAPIO located in Russia. That kind of teleoperation would allow hands-off exploration of a planetary surface by astronauts, though it would have to be a short-range data link, probably on the planet's surface. "You cannot do tele-operations from Earth because of the delays – it takes about 30 minutes for a signal to come back from Mars – so you have to build significant autonomy into robots," says Vijayakumar. "It's not like the robot has a mind of its own, but it needs to able to take care of low-level operations." He also points out that communications channels in space are typically unreliable, so the tele-operation of an avatar-robot while orbiting Mars would likely be disrupted. The use of lasers to create 'space broadband' could change all that, though British ESA astronaut Tim Peake already remotely operated a Mars rover in an Airbus facility in Stevenage, UK while aboard the ISS last year. Is the Jetson lifestyle truly upon us? Space is just too big to make real-time control of anything remote possible. So why waste time working on ways to send humans safely to other planets when you could just, you know, directly upload their brains to tiny 'space fairies'? "Once we can do a full direct mind-link and put the human mind inside a computer, we could fit about 10,000 human minds in the volume of a cubic millimetre – a pin-head," says Pearson, explaining that nanotech devices could theoretically be put beside every neuron and synapse in your brain and create a deep neural network in silicon that's an exact copy. But… space fairies? Pearson's predictions of advances in genetic engineering, IT and consciousness development go way further. "You could make a fairy-sized space farer just a few centimetres tall or smaller, which would make space travel so much easier – and it would also be much easier to build wormholes if you wanted to have high-speed space travel." It all sounds bizarre, yet Pearson thinks that it will be possible this century, probably around the year 2090. "Nobody expects us to be doing interstellar travel before then anyway," he reasons. He's right. But Pearson's point is that the technology to upload our brains will come a long time before conventional Star Trek or Passengers-style interstellar missions into the cosmos aboard vast spaceships. Uploading a brain to a tiny 'space fairy' has other intriguing possibilities. "Once you've digitised a human mind, you could make as many copies of you as you like, and send them out all over the cosmos," he says, adding that if we identified a particularly good astronaut-explorer, we could clone them, and generally use cloning to more quickly colonise other planets. Small astronauts, in small space-ships, would go a lot faster. "Space travel will become a lot easier," says Pearson. And a lot weirder, too.